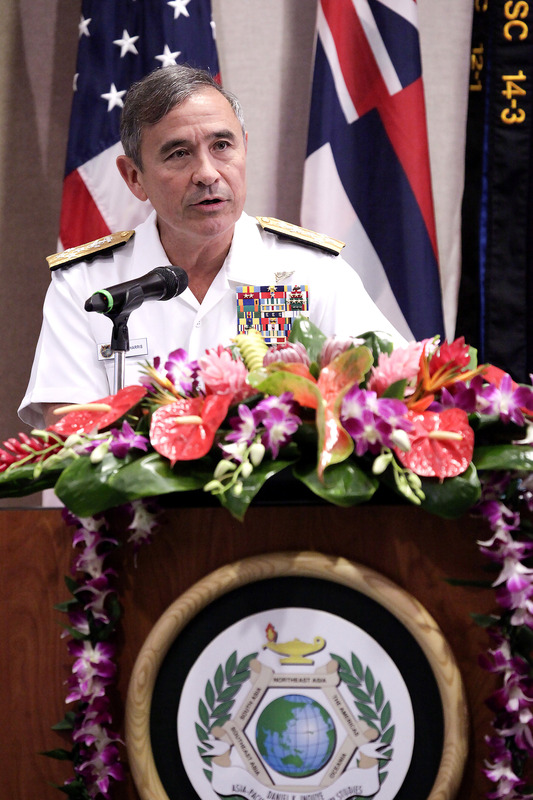 Commander of U.S. Pacific Command Adm. Harry Harris, Jr., provides remarks at today’s 20th Anniversary celebration of the Daniel K. Inouye Asia-Pacific Center for Security Studies. Harris paid tribute to the Center’s contributions to regional security. Fellow guest speaker and Department of Defense official Kelly Magsamen agreed. She noted, however, they also offer opportunities for collaboration. Speaking to an international audience attending the DKI APCSS 20th Anniversary celebration, Magsamen and Harris emphasized DKI APCSS’ key role in helping the region navigate its evolution peacefully. “Opportunities (in the region) allow us to collaborate on issues ranging from humanitarian assistance to maritime security to counterterrorism in order to help manage tensions and prevent conflict. 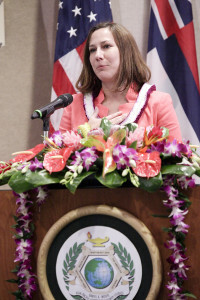 And there’s no place better suited to help maximize these opportunities than DKI APCSS,” said Magsamen, principal deputy assistant secretary of defense for Asian and Pacific security affairs. The Center provides a gathering place for the region’s security practitioners to build collaborations skills, increase knowledge of factors impacting Asia-Pacific security, and to come to a shared understanding on how to solve regional problems. The Center answered DoD’s call, for example, to facilitate the May 2015 “Building Maritime Shared Awareness in Southeast Asia” workshop in support of ASEAN. DKI APCSS guided 71 participants from 10 nations in sharing best practices in multinational information sharing. The intent was to evaluate lessons learned and how to apply them in countering piracy and trafficking, and improving search and rescue and crisis response. “The outcomes of that engagement has helped us increase our understanding of security complexities in the region and helped (us) better adapt our policies to keep the seas of Southeast Asia free and open,” Magsamen related. 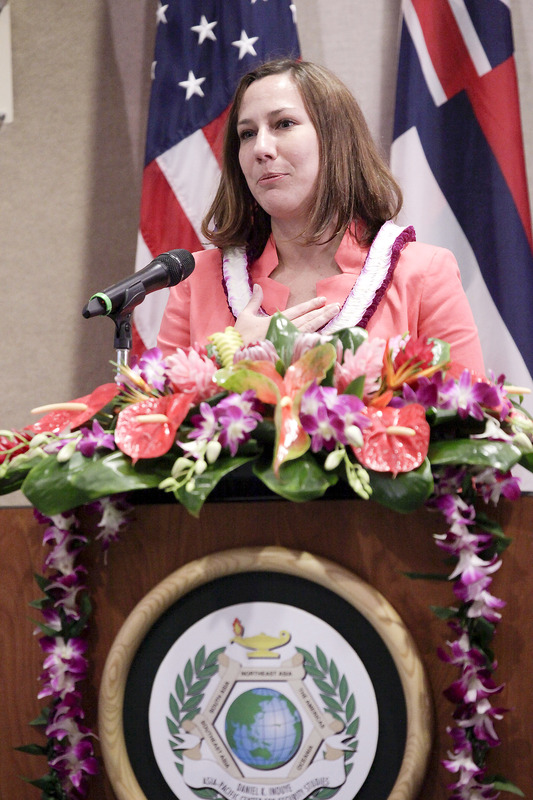 Kelly Magsamen, principal assistant secretary of defense for Asian and Pacific security affairs, addresses attendees at the Oct. 6 Daniel K. Inouye Asia-Pacific Center for Security Studies 20th Anniversary celebration. She honored the Center’s role in building cooperation among regional security leaders through open dialogue and information sharing. Since 1995, DKI APCSS has conducted more than 200 dialogues and workshops in more than two dozen nations. Recent workshops focused on helping the Lao People’s Democratic Republic prepare for assumption of the ASEAN chairmanship and helping Fiji form a new national security strategy.